With a handy size and a very affordable price, this collection offers a well-balanced selection of classic and contemporary literature — 40 stories, 200 poems, 9 plays — for the introductory literature or literature for composition course. 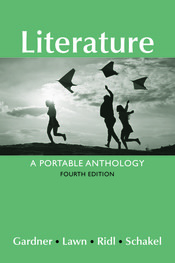 The literature is chronologically arranged by genre and supported by informative and concise editorial matter, including a complete guide to writing about literature and, in the fourth edition, increased coverage of close reading. As a member of the popular Bedford/St. Martin's series of Portable Anthologies and Guides, this volume offers a trademark combination of high quality and great value.